Bindlestiff (BIN-dl-stif) noun. A hobo who carries a bundle of bedding and other possessions. From English bindle (bundle) + stiff (tramp). Tonight through Sunday, the Bindlestiff Family Cirkus is bringing their cabaret show – a mix of vaudeville, circus, Wild West, burlesque, and sideshow – to the Brooklyn Lyceum. The variety arts troupe founded by Stephanie Monseu (Ringmistress Philomena) and Keith Nelson (Kinko the Clown) is celebrating their 20th anniversary season. 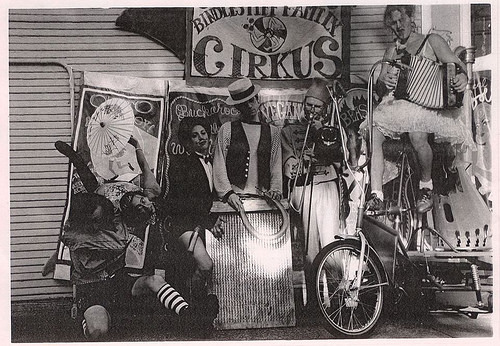 Over the past few weeks, they’ve been posting photos from the family album on their Facebook timeline, beginning with this old-timey snapshot from 1996 with some of the many performers who’ve been with the Cirkus. It’s also a reminder of the many venues where we’ve seen the troupe perform, from Coney Island to Rhode Island, from the Bindlestiff’s Palace of Variety on 42nd Street to a Spiegeltent. For a calendar of upcoming events through the spring and summer, visit http://www.bindlestiff.org. 20th Annual Bindlestiff Family Cirkus Cabaret, March 13-16, 8pm shows are 18+. $20 advance / $25 door / $10 discount for anyone in circus makeup. Family matinees for all ages on March 15 and 16 at 3pm. $12 / 4 for $40. Info: 1-877-BINDLES. Brooklyn Lyceum, 227 4th Avenue, Brooklyn, New York 11215.